The Fiona mat is just awaiting the date which is about a month away. 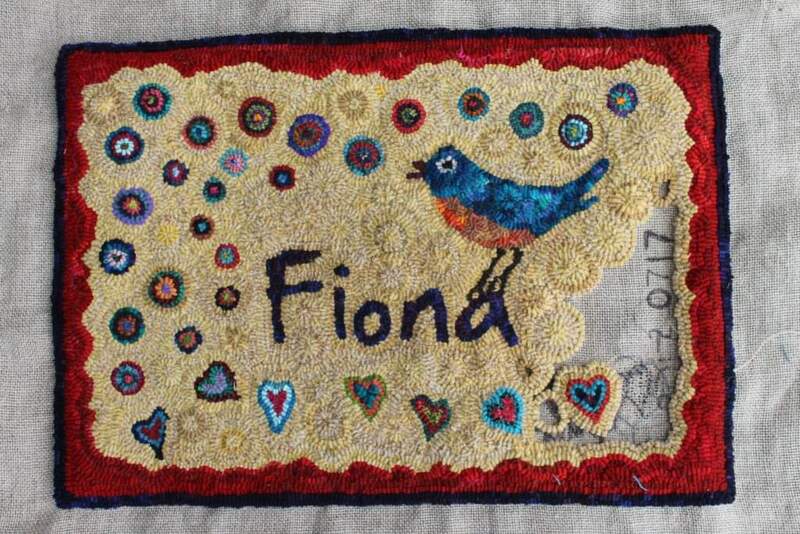 I’ve loved hooking this mat with its bright pops of colour. The background is my favourite, a series of textured yellows, checks and dots. The rest of the mat is from my leftover basket, combining like colours in the border and using complements in the dancing hearts and circles. It is my preferred way to hook…with serendipity. Using what is on hand seems to always comes out the best. This little mat measures 24″x16″. I love to search for local fabric when I travel. So from Scotland, Harris Tweed, and from the south of France? Toiles-du-Soleil! 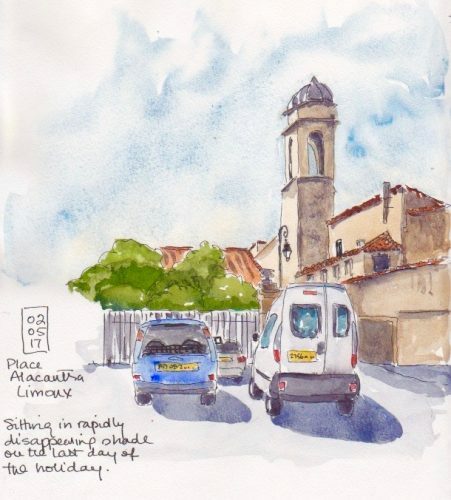 We were lucky to spend a beautiful day in Collioure. 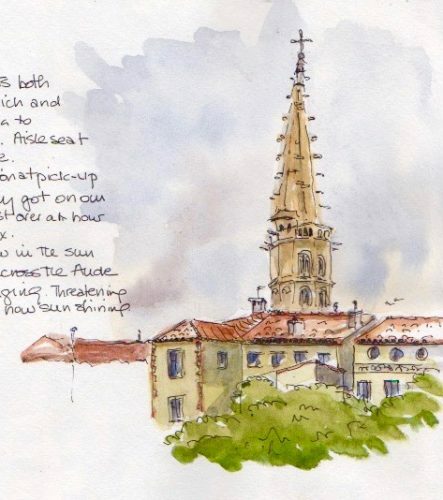 It is an inspiring place with picture frames mounted about the town showing you the exact view painted by Matisse, Derain and others. 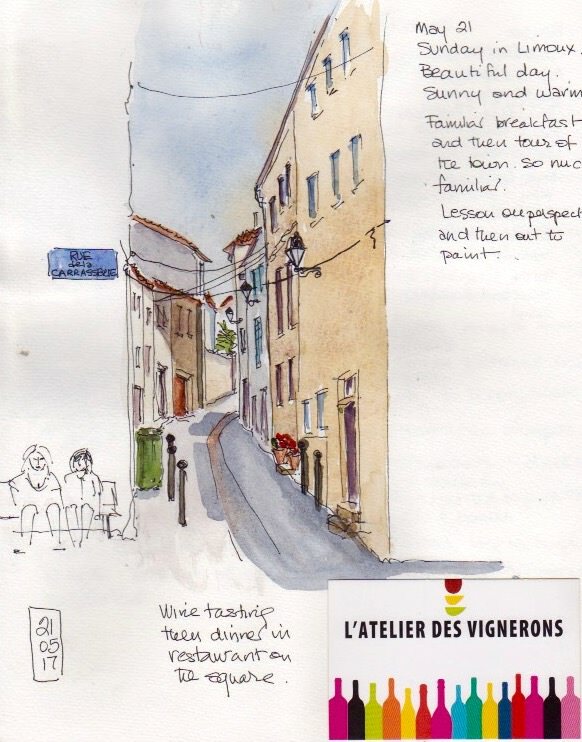 We sketched and took the little train through the vineyards to the top of the hills but I also had time to search out a store I remembered which sold Toiles-du-Soleil. 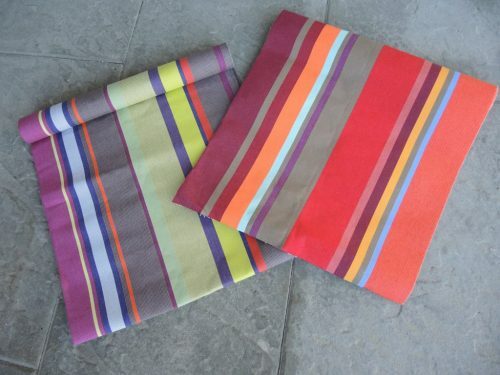 This bright striped fabric perfectly captures the atmosphere of Collioure. I bought enough for half a dozen bags and a couple of pouches. This colourway is called Collioure Rouge–perfect. 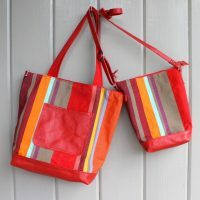 So here are the first of the bags of this gorgeous fabric, trimmed in red leather. The first is a cross-body bag, the perfect summer carrier. 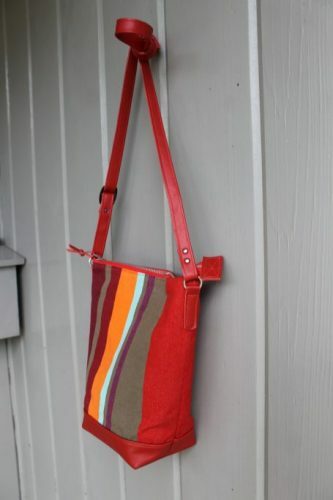 It is lined with moss birdbrain fabric, and has an interior leather pocket, an adjustable shoulder strap, red durable metal zipper closure and a leather bottom. 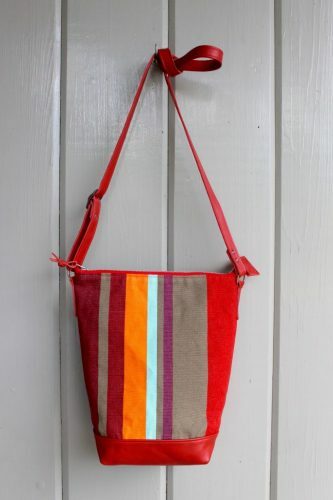 It’s bright and cheery and will carry all your summer essentials. 10″ wide x 12″ high x 4″ base. 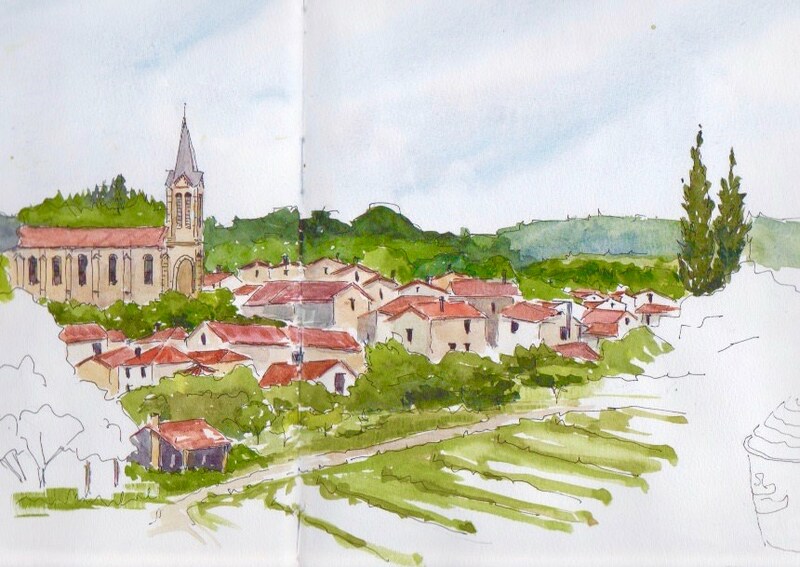 It’s been a week since I arrived home from my sketching trip in the south of France. I am gradually scanning my sketches and finishing the half-done ones. 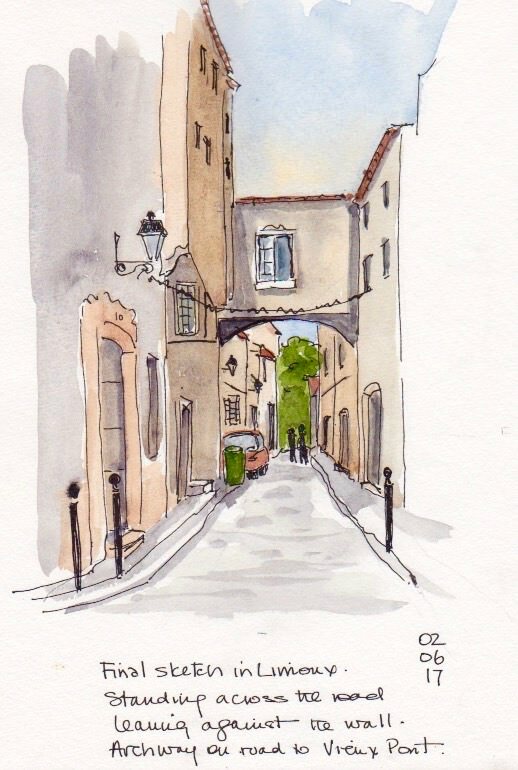 Here is the last sketch I did, one of my favourite streets in Limoux, narrow and winding as they all are, but this one with its own arch. 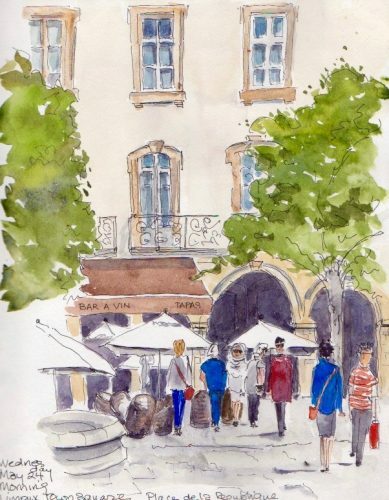 It’s just off La Place de la Republique and on the way to the Vieux Pont, a well travelled route. 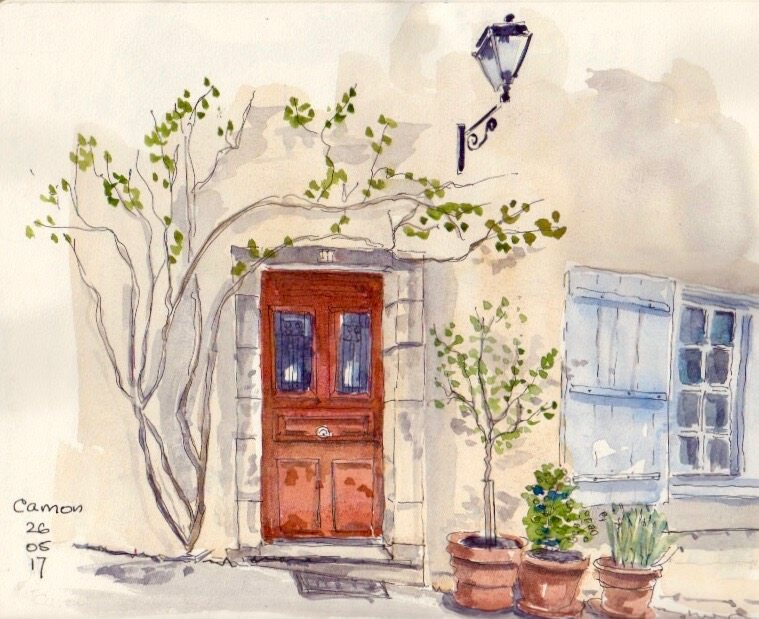 I stood leaning against a wall and sketched the view, paint added later. 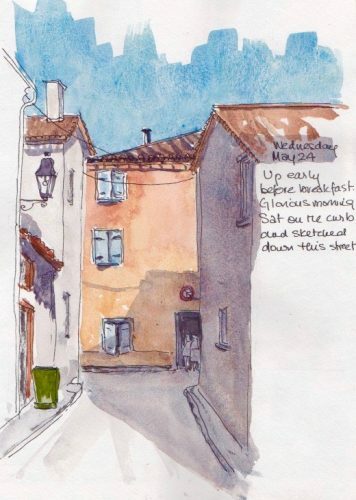 I find that it is the small sketches, done quickly as I am sharing a cafe table or leaning against a wall that are the most memorable. 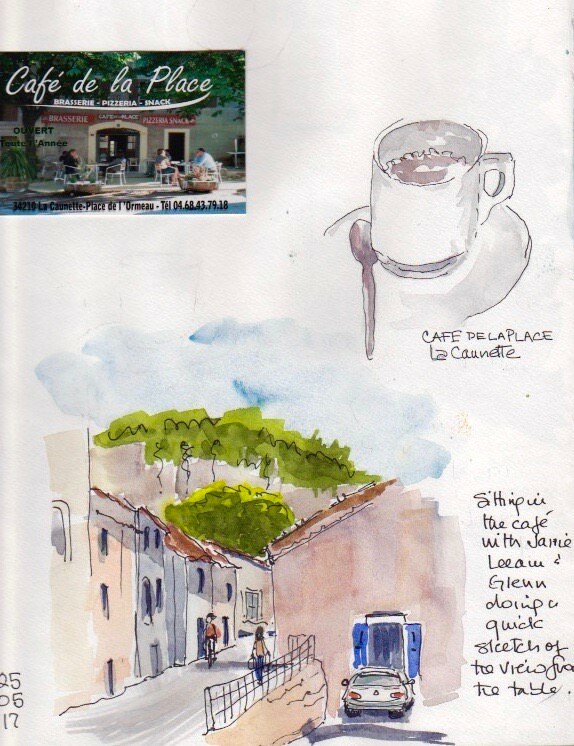 This one in La Caunette, a tiny village with a great outdoor café. I loved this red door alongside the town square in Camon. A finally the view from the hills above the town of Puivert. 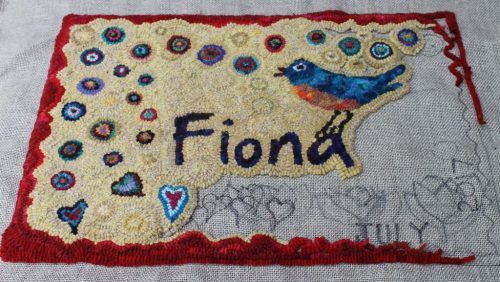 Here is my progress on the Fiona mat. You can see I am still developing the design. And of course, I don’t yet know the date. I’m thinking of a row of dancing hearts across the bottom and the date along the right hand border. Around the very outside will be a couple of rows of dark to echo the colour of the text. I like hooking anytime, but I find it the best activity when I am trying to process a big trip and return to my life here. Calming, meditative, productive. And here is a burst of bright colour from my trip. This is Catalan fabric which is woven in the south of France. 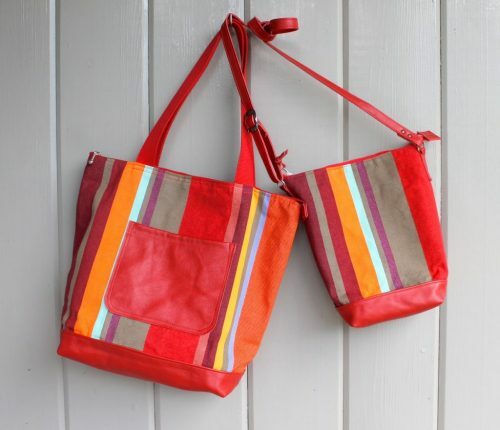 When I was last in Collioure in 2011 I bought some of this fabric and made some small pouches. I was delighted to find the store still in the same place still selling their famous stripes. 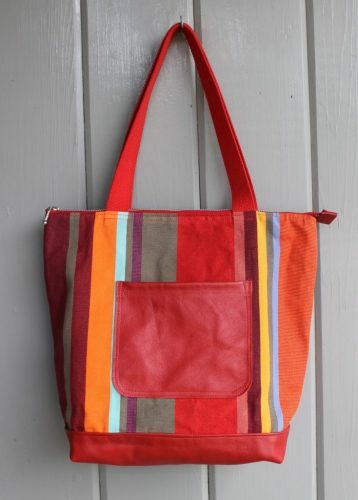 I bought enough to make several totes and will pair the fabric with leather bottoms and straps. A great combination. The fabric is durable as it is woven for deck chairs and the colour is unbeatable. 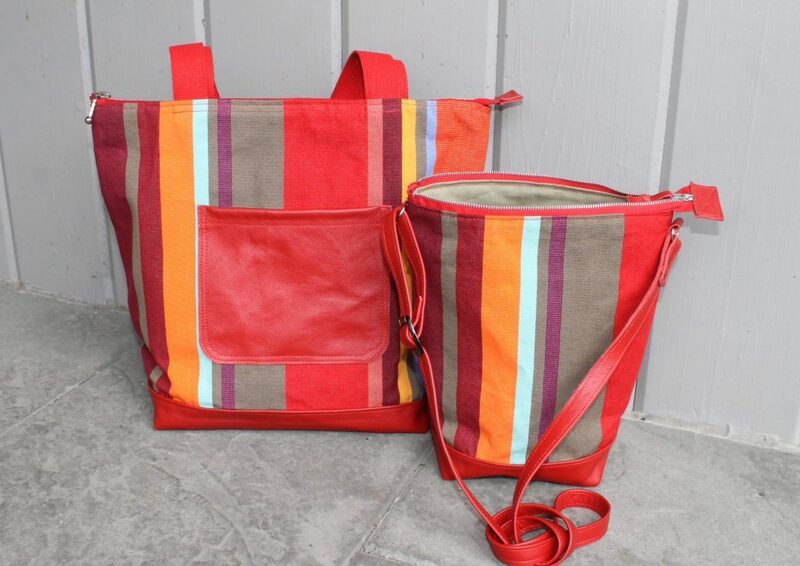 Stay tuned for these gorgeous totes.